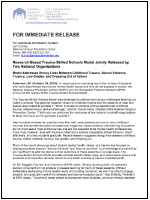 Access the video of National Dropout Prevention Center Director Dr. Sandy Addis testifying to the South Carolina House Education Committee on School Climate and Safety regarding the importance of addressing stress and trauma in education and introducing the National Dropout Prevention Center Trauma-Skilled Schools Model. The sources of trauma and stress are widespread, have a direct relationship to the dropout issue, and must not be underestimated. 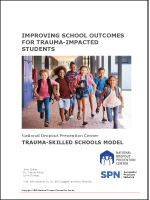 It is the position of the National Dropout Prevention Center that to meet students’ needs for safe learning environments and to achieve the best outcomes for the most students, all educators and support staff in a school must not only have a shared understanding of trauma and speak a common language about it, they must also acquire shared trauma-related skills, behave consistently and in unison toward trauma-impacted students, and be able to articulate and justify their behaviors in terms of desired student outcomes. 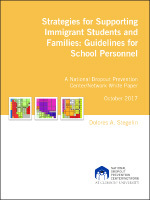 This paper looks at some of the laws involved as well as strategies for supporting immigrant students and families, and includes guidelines for school personnel.